Welcome back to football, everyone! The season officially opens in less than two weeks, and now is about the time to get those season-long picks in. Just like last year, I'll be going around every division in the league and measuring their prospects of going over or under their projected regular season win total. More importantly, I'm making a few changes from last season's predictions. Instead of simply giving a pick for each team, I'm going to weight my picks this year; 4 units for my top pick in the division, and 1 for the worst, with 2 and 3 being in the middle. This will make results a little bit more meaningful and help emphasize which teams I think are a bargain this year. Last year was survivable, as I went 18-14 overall for about 56%. Again, with the introduction of variable units for each pick, hopefully this year will yield an improved outcome. To start, lets take a look at the NFC West. The NFC West is shaping up to be one of the worst divisions in football again. To me, it's looking like the Rams and Cardinals are on a different plane than the Niners and Seahawks. With the latter two teams lacking a viable quarterback, the unproven Kevin Kolb is immediately the second-best QB in the division at worst, with only Sam Bradford as any real competition within the division. The Cardinals have looked good in the preseason, but no NFC West team is without faults. Arizona's defense was shaky last year, and though they've drafted rookie Patrick Peterson, they traded away Dominique Rogers-Cromartie when they acquired Kolb. However, they managed to go 5-11 last year with arguably the worst trio of QBs in the league, so it's hard not to imagine the presence of Kolb improving them by at least a few games. The Cards could quite possibly start the season 3-0 (CAR, @WAS, @SEA), and with potential cupcakes (CLE, @CIN) on the schedule at the end of the year, along with a soft division, I like their chances of making the over. It will likely be another long year for Alex. Hard to pick a team starting Alex Smith with a rookie backing him up to make 8-8. The first team defense has looked strong in the preseason, however, and with a young offensive line, it's possible the team may develop enough to overcome the deficiencies at QB, though I highly doubt they are capable of winning the division. 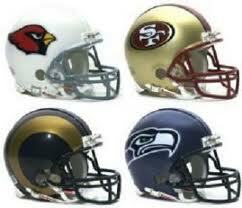 I project the Niners to finish third or fourth in the NFC West. I'm only willing to stake 1 unit on them, though. I feel this team may end up being highly unpredictable from week to week, given the amount of youth on the roster. The defense and running game may be good enough to steal some wins in the division, too, making this a dicey pick, in my opinion. Seattle looks like a lock for 4th place in the NFC West. 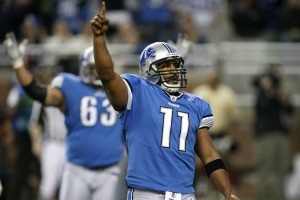 Tavaris Jackson and Charlie Whitehurst both look far from starting caliber QBs. Having invested several draft picks into the offensive line over the past two years, I'm not surprised people are speculating that the 'Hawks are waiting for Andrew Luck to show up. With holes at virtually every spot on both sides of the ball, I project Seattle to be among the worst teams in the league. Under 6 looks like a push at worst. The NFC West faces both the NFC East and AFC North this year, so I don't expect may wins outside of the division for the Seahawks either. This is a rebuilding year. They are also negatively impacted by the rule changes to kickoffs, as RB Leon Hall was a dynamic kick returner last season. 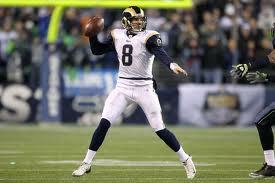 Can Bradford bring the Rams a division title this year? The Rams are the team with the most promising near-term future in this division. The off-season was highly productive, as they filled holes in the draft, spending picks on pass rushers and receiving weapons for second-year QB Sam Bradford. They were also active in free agency, adding depth to several positions (RB, Safety, to name a couple) across the roster. I've liked what they've done to improve, and given the fact two of their division rivals have very questionable QBs, they should be in contention at the top of the NFC West with Arizona. The Rams lost 4 games last year by 4 points or less while finishing 7-9 with a rookie QB at the helm. They should definitely get to at least 8-8 this year, and quite possibly the playoffs. The Seattle Seahawks are fortunate they pursued and signed Zach Miller in free agency. That’s because tight end John Carlson will miss the entire season after Seahawks coach Pete Carroll announced the veteran will require surgery to repair a torn labrum, an injury that will keep him out for the entire season. That ends plans the team had to use double tight end packages with some big targets skilled in the passing game. “It's disappointing because John has had a great start to camp," Carroll said, according to Danny O’Neil of the Seattle Times. "He was rocking and rolling, and those two guys out there together looked really good. Fortunately, our tight ends have really played well." This means Dominique Byrd, who played for Carroll at USC, and Anthony McCoy will figure in the roster mix. Carlson caught 106 passes in his first two seasons with the team before slumping last season in the offense. With new offensive coordinator Darrell Bevell, the plan was to use him more this year. The receiver that the Redskins once envisioned as the next Andre Johnson is no longer one of the best 80 players in the organization. The Redskins waived/injured wide receiver Malcolm Kelly on Tuesday as they trimmed the roster to 80. Kelly, who was taken with Devin Thomas in the second round of the 2008 draft, has struggled to stay healthy his entire career. Kelly had 28 catches in three years. Also cut: linebacker Eric McBride, offensive lineman Corey O’Daniel, kicker Clint Stitser, tight end Joe Torchia, defensive back Dante Barnes, quarterback Ben Chappell, offensive lineman Xavier Fulton, and defensive back Tyrone Grant. Here’s one we weren’t going to mention, since it’s meaningless. But since plenty of you think that there’s something potentially ominous or nefarious about the development, it makes sense to address it. The Titans placed running back Chris Johnson on the reserve/did not report list on Monday, roughly a month after he did not report for training camp. The move coincides with the team’s effort to trim the roster to 80 players. By sliding Johnson to the “reserve” designation, he doesn’t claim a spot. Johnson will remain on the reserve/did not report list until he (duh) reports. That way, the Titans can have 80 players for the preseason finale — and 53 for the first week of the regular season, if Johnson doesn’t show up by then. Barring a major development, he likely won’t be showing up by then. 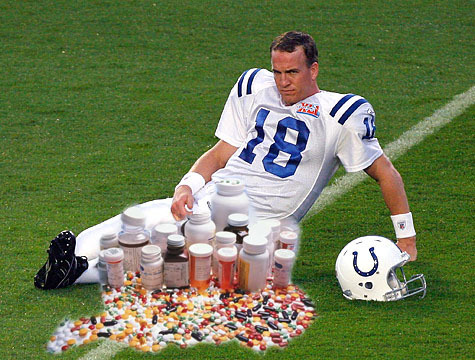 The Indianapolis Colts have activated quarterback Peyton Manning from the physically unable to perform list. Manning is recovering from offseason neck surgery, his second procedure in 15 months, and will return to practice on a limited basis. The team notes that Manning's practice work will be scripted and on a controlled basis. The four-time MVP hopes to be ready for the start of the regular season-opener against the Houston Texans on September 11. It was not a very memorable night for the New England Patriots on Saturday night, even if it was just preseason. The Pats were thrashed by the Detroit Lions, 34-10, but worse than that, had receiver Wes Welker leave with a neck injury, making a tackle on an interception. Welker went off under his own power, but was quickly tended to by the New England medical staff. Quarterback Tom Brady spoke of Welker's toughness and his value to the Patriots offense. The Pats need to hope that Welker is OK, because other than Brady, he is arguably New England's most indispensable player on offense and maybe on the entire roster. 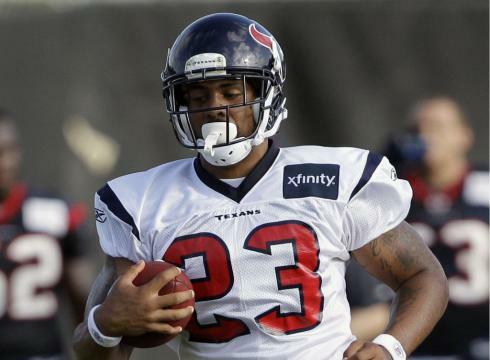 With the season opener only 14 days away and with Texans running back Arian Foster suffering from an aggravation of the hamstring injury he sustained on the first day of training camp, Houston fans (and all fantasy football players who have drafted Foster) are getting nervous. Coach Gary Kubiak sounds optimistic. At least for now. Still, Kubiak acknowledged that the news won’t be as good as it can be until Foster actually returns. The Texans open against the Colts on September 11. 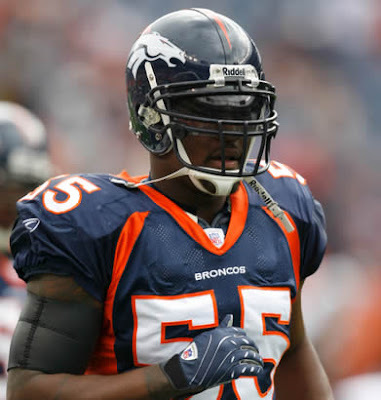 Mike Klis of The Denver Post reports that Denver Broncos linebacker D.J. Williams suffered a dislocated right elbow during last night's 23-20 preseason win over the Seattle Seahawks. "I’ll be all right," said Williams, whose arm was described as "heavily bandaged" after the game. Williams is expected to miss 3-to-4 weeks, which means the Broncos could be without their starting weak side linebacker for their first two games of the regular season, which are against the Oakland Raiders and Cincinnati Bengals, two run-heavy offenses. Williams has led the Broncos in tackles in three of the last four seasons. Fourth-year linebacker Wesley Woodyard is expected to start in Williams' place. The Philadelphia Eagles played musical chairs on the offensive line a year ago with injuries forcing quite a bit of movement. Here’s hoping the loss of Ryan Harris for at least the immediate future isn’t a sign of more problems to follow. CSNPhilly.com cites two league sources in reporting Harris will undergo back surgery soon, a development that wipes him out of the picture at right tackle now after he had quickly topped the depth chart. Winston Justice, the starter there last season, had two knee surgeries during the offseason and has been unable to practice. Harris injured his back in the preseason opener and made it back for only one practice. Per the report, he’s had three previous back surgeries going back to his time at Notre Dame. He signed a $685,000 contract that was not guaranteed. King Dunlap, Reggie Wells, Austin Howard and even veteran guard Todd Herremans are options. Sounds like the Eagles need Justice back. Soon. 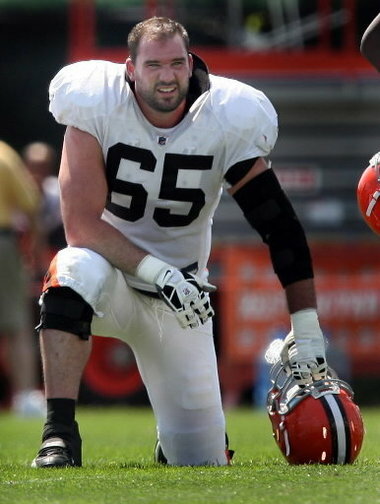 The Cleveland Browns could be without starting left guard Eric Steinbach for the entire 2011 season, Mary Kay Cabot of the Cleveland Plain-Dealer reports. Steinbach is seeking a second opinion about a disc problem in his back. If surgery is required, Steinbach would assuredly be placed on injured reserve. "At this point, he's going through some treatments that we're hoping will get him back, and there's no real final call yet on whether he'll be back -- or when actually," said Browns first-year head coach Pat Shurmur. The 31-year-old is due $6.85 million in total compensation in 2011. 2011 fifth-round pick Jason Pinkston (Pittsburgh) started for Steinbach on Thursday night and could be called upon to start the regular season between perennial Pro Bowl left tackle Joe Thomas and third-year center Alex Mack. Those two talented linemen may be able to mask Pinkston's inexperience. Long one of the most well-liked 49ers, running back Frank Gore has had a hard time hiding his frustrations this camp regarding the lack of a new contract. 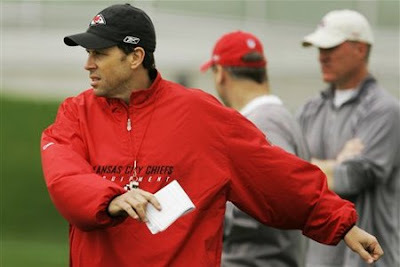 Matt Maiocco of CSNBayArea.com reports that Gore has uncharacteristically “snapped” at some of his assistant coaches. Some of his frustration may come from playing more in the preseason than previous years. Gore is hoping to get a contract before the season starts. His agent will meet with the 49ers next week in an effort to do so. It will be interesting to see how many carries Gore gets Saturday night following the news. 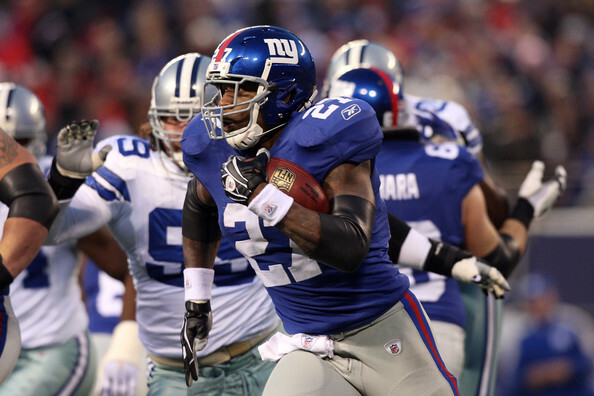 The New York Giants all but promised Brandon Jacobs a more expanded role in the offense this season. The bruising 6-4, 260-pound running back agreed to a modest salary reduction to help the team re-sign backfield mate Ahmad Bradshaw, and now with Bradshaw slowed with a back issue, Jacobs is showing everyone why. Jacobs rushed for 48 yards on six carries in the Giants’ victory over the Chicago Bears Monday night at New Meadowlands Stadium, the longest run an 18-yard dash up the middle for a touchdown. He completely faked out free safety Major Wright. "My main goal is to come out and help this team," Jacobs said, according to Ralph Vacchiano of the New York Daily News. "I trained for this. I've been ready for this since March. I did the most (training) I've ever done in any offseason. The level for me just keeps getting higher and higher." "If (Bradshaw) got (the featured role), he got it. That doesn't bother me at all. Just give me what I think I'm due. Just give me a little more carries." Tennessee Titans running back Chris Johnson's holdout continues as a face-to-face meeting on Wednesday did little to bridge the gap between the two sides. "I feel like I came in yesterday and they gave me their points and we gave them all of our points, and we are not seeing eye-to-eye right now," Johnson said on Thursday. Johnson has two years and up to $2.65 million remaining on his rookie contract, but is reportedly seeking an extension that contains over $35 million in guarantees. The Titans are willing to make Johnson the highest-paid running back in NFL history, but a deal does not appear close. Mike Florio of ProFootballTalk.com reported that a trade request could be the next step in the process, but head coach Mike Munchak says the team will not trade the three-time Pro Bowl running back. For tonight at least, Rex Grossman is the Washington Redskins’ starting quarterback. Redskins G.M. 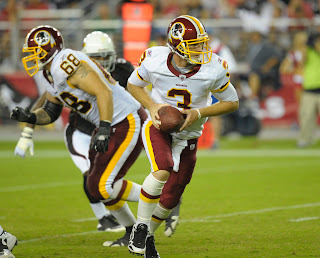 Bruce Allen said on ESPN 980 that Grossman will get the start for tonight’s preseason game against the Ravens. The plan is for Grossman to play the first two series with the first-string offense, and then John Beck to play the next two series, still with the first-string offense on the field. Beck is generally recognized as the favorite to win the starting job, but Redskins coach Mike Shanahan says he won’t announce who his starter is until “right before” the September 11 opener against the Giants. Free agent tight end Anthony Becht has agreed to terms on a one-year deal with the Kansas City Chiefs, Mike Florio of ProFootballTalk.com reports. After catching 120 passes over his first four seasons in the league, the 6-foot-6, 270-pound Becht has been valued primarily for his blocking ability. 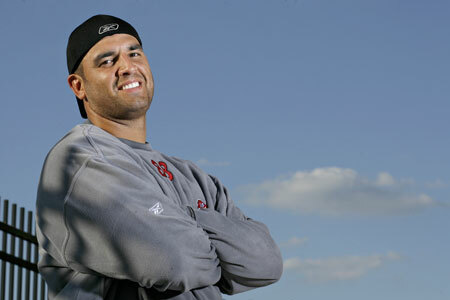 A first-round pick in the 2000 NFL Draft out of West Virginia by the New York Jets, the 34-year-old Becht has caught 185 passes for 1,511 yards and 21 touchdowns during his 10-year career with the Jets, Tampa Bay Buccaneers, St. Louis Rams, and the Arizona Cardinals, where he spent 2009 and the 2010 preseason. Free agent linebacker Kirk Morrison has signed a one-year deal with the Buffalo Bills, Jay Glazer of FOXSports.com reports. Morrison himself tweeted the news on Wednesday. 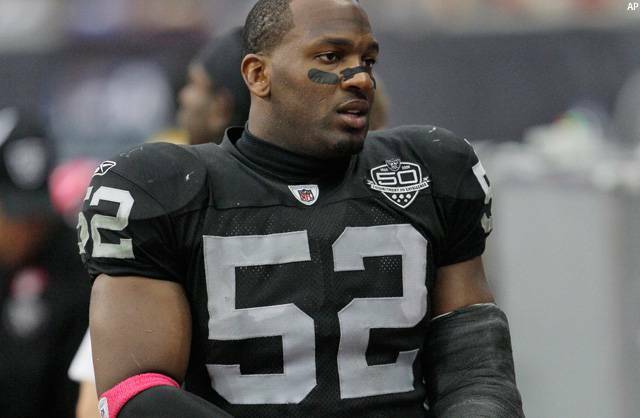 Originally selected by the Oakland Raiders in the third-round of the 2005 NFL Draft out of San Diego State, Morrison has started 95 of 96 career games and has 720 tackles, five quarterback sacks and seven interceptions in his six-year career. Morrison spent the first five seasons of his career in Oakland before he was traded to the Jacksonville Jaguars during the 2010 NFL Draft. The 29-year-old has played middle linebacker throughout his career, but will be an inside 'backer in the Bills' 3-4 defense. Indianapolis Colts owner Jim Irsay announced on Twitter that the team had agreed to terms with veteran quarterback Kerry Collins. The Colts have been looking for a veteran backup quarterback as insurance for Peyton Manning, who is recovering from offseason surgery on his neck and may not be ready for the start of the regular season. The four quarterbacks who have played for the Colts this summer -- Curtis Painter, Dan Orlovsky, Nate Davis, and Mike Hartline -- have combined to complete 22-of-52 passes for 309 yards with one touchdown and four interceptions for a passer rating of 36.5. Collins, 38, has spent the previous five seasons with the Tennessee Titans and had announced his intention to retire in July. The Titans used their first-round pick in 2011 on quarterback Jake Locker and signed Matt Hasselbeck to be the bridge to the Locker Era in Nashville. Collins appeared on Monday's NFL transaction report as being one of the Titans' unrestricted free agents who was not asked to re-sign. During Collins' 16-year career with the Carolina Panthers (1995-98), New Orleans Saints (1998), New York Giants (1999-2003), Oakland Raiders (2004-05), and Titans, Collins completed 55.8% of his 6,163 pass attempts for 40,441 yards with 206 touchdowns and 195 interceptions for a career passer rating of 73.9. Collins went to the Pro Bowl in 1996 and 2008. When the Browns host the Eagles on Thursday night, defensive tackle Mike Patterson will make his preseason debut, more than three weeks after suffering a seizure during practice. Doctors diagnosed Patterson as having a tangle of blood vessels in his brain. Initially, it was reported that he’d undergo surgery or radiation treatments. Patterson has since returned to practice, and he’ll suit up and play in less than two days. Reid said that Patterson’s total plays likely will be limited. It’s great news for Patterson and for the Eagles as they prepare for a Week One trip to St. Louis. Now that Broncos quarterback Tim Tebow has dropped to the bottom of the depth chart in Denver, there’s suddenly scuttlebutt and speculation that Tebow could be run out of town. But the question of whether to keep or to move Tebow depends on much more than $6.7 million that the Broncos committed to pay when they signed him in 2010. The issue is whether the Broncos believe Tebow has a future with the team, and whether they want to keep him around if they’ve concluded that he doesn’t. Though it’s very possible that new coach John Fox has decided that he’s not a believer in Tebow, it would be a mistake to run him off right now. Success of the franchise in 2011 would make a Tebow trade an easier pill for the locals to swallow, and Tebow’s presence provides a little leverage in the looming contract talks with Kyle Orton, who’ll be a free agent after this season. Then there’s the challenge of finding a trade partner. 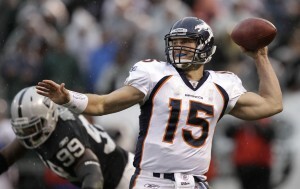 Unless former Broncos coach Josh McDaniels parlays one season as the Rams’ offensive coordinator into a second bite at the NFL apple, there may be no one who’d want Tebow. In the end, this is simply another example of the reality that a new head coach wants his own guy at quarterback. Tebow was the last guy’s guy, which makes the new guy naturally less inclined to keep him around, absent a reason to believe that Tebow is the real deal. 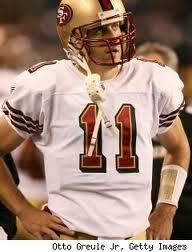 If Fox thought that, Tebow wouldn’t have fallen behind Brady Quinn. 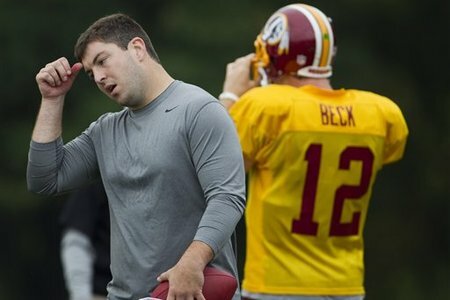 John Beck appears to be ahead of Rex Grossman in the Redskins’ quarterback derby, but coach Mike Shanahan says he’ll take his time making an announcement. In fact, Shanahan said Monday he won’t say who his starter is until “right before” kickoff of the Redskins’ Week 1 game against the Giants. Shanahan added that Beck and Grossman are “very close right now,” and Redskins offensive coordinator Kyle Shanahan says both of them will play with the first-string offense in Thursday’s preseason game against the Ravens. So for now, the Shanahans want everyone to believe this is an even competition that could end up going either way. 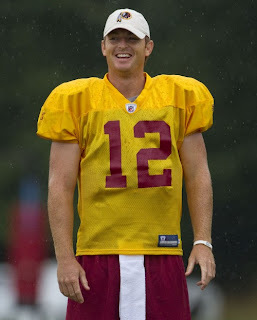 But soon enough one quarterback will start getting the vast majority of the practice reps with the starting offense, and whether Shanahan announces it publicly or not, it’s safe to say we’ll all hear which quarterback that is well before the Redskins take the field against the Giants. The smart money is on that quarterback being Beck. The Colts typically protects information like a fat kid guards his Twinkies. With the exception of the owner. Jim Irsay has a Twitter account. And he likes to use it. On Saturday, he created a stir by suggesting that the Colts may not have quarterback Peyton Manning, who is recovering from neck surgery, at the start of the season. Meanwhile, Manning acknowledged on Saturday that his status is still up in the air. 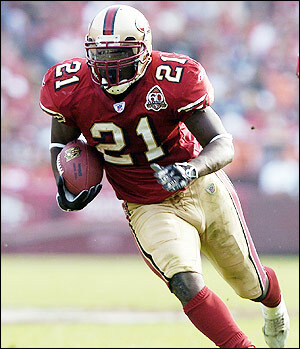 According to Mike Florio of ProFootballTalk.com, San Francisco 49ers running back Frank Gore is frustrated with the status of talks towards a new contract and may request a trade. PFT's source close to the talks describes the talks as "volatile". The 28-year-old Gore is set to earn $4.375 million in total compensation, including a $2.9 million base salary, in the final year of his contract. A fractured hip limited Gore to just 11 games in 2010, ending the two-time Pro Bowlers streak of 1,000-yard seasons at four. 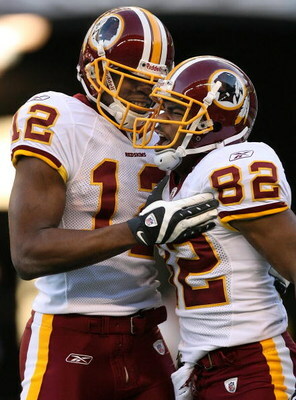 Gore has also added 270 receptions for 2,283 yards and nine touchdowns during his six-year career. Gore, who is looking for DeAngelo Williams money, briefly held out of training camp, but has started both preseason games and has 41 yards on eight carries. Williams' deal is worth $43 million over five years with $21 million in guarantees. Williams will receive $19.5 million in the first year, $25 million over the first two, and $30 million over three. The Arizona Cardinals and Pro Bowl wide receiver Larry Fitzgerald have agreed on a eight-year deal worth $120 million, ESPN's Adam Schefter reports. According to Schefter, the deal includes close to $50 million in guarantees. The 27-year-old Fitzgerald is scheduled to earn $7 million in 2011, which had become the final year of a four-year, $40 million contract from 2009 that voids after this season. The Cardinals were also prohibited from using the Franchise or Transition tag on Fitzgerald if the 2012 season voided. 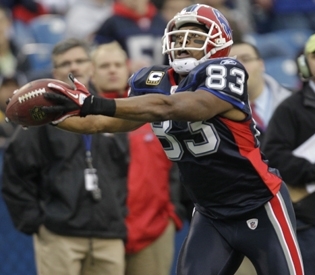 Selected with the third overall pick of the 2004 NFL Draft out of Pittsburgh, Fitzgerald has 613 receptions for 8,204 yards and 65 touchdowns during his seven-year career, which has included five Pro Bowls and one All-Pro selection. Raiders quarterback Jason Campbell left Saturday night’s game with an undisclosed injury. Campbell was seen flexing his hand, then left the game. He stood on the sidelines without being attended to by medical staff, which would seem to indicate the injury isn’t too serious. Still, Trent Edwards entered the game and stayed in until halftime hit. Oakland trails San Francisco 3-0 at the half. Both teams actually moved the ball fairly well, especially the 49ers who racked up 226 yard to 135 for Oakland. But one 49ers drive stalled on the two yard-line and Alex Smith threw an interception to kill another drive. Smith completed 8-0f-13 passes for 126 yards and the interception. Campbell was 5-of-7 for 74 yards before leaving. A source has told Ian Rapaport of the Boston Herald that veteran running back Clinton Portis was in town to work out for the New England Patriots. The Patriots said, of course, that Danny Woodhead was OK after taking a hard hit in Thursday night's victory over the Tampa Bay Buccaneers. But the fact that they are kicking the tires on Portis is interesting. 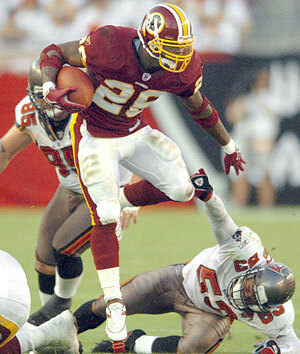 On Sept. 1, Portis turns 30 – the magic age when running backs' productivity often begins to disintegrate. To boot, he has gained just just 721 yards in 13 games played over the past two seasons. That's the bad news. The good news is that Portis is still only two years removed from a 1,400-yard season for the Washington Redskins and even in his two injury-wracked years in 2009 and 2010, he still averaged better than four years per carry. Rapaport says the Patriots' signing of appears to be a long shot, but sometimes Bill Belichick has a knack of taking a guy thought to be past most productive days and squeezing quality performances out of him. See Moss, Randy among many others. 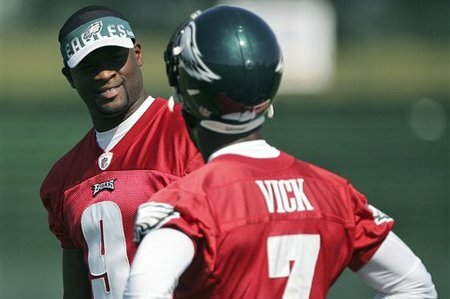 Early in the FOX broadcast of the Eagles-Steelers preseason game, sideline reporter Pam Oliver had a tidbit regarding the “Dream Team” label applied by the Eagles by backup quarterback Vince Young. She also said that the team wants to portray an image not of glamor but of a hard-working, blue-collar mentality. The front office should have thought about that before they rounded up a bunch of guys whose names connote luxury more than lunch pail. When cornerback Deion Sanders recently entered the Hall of Fame, he seemed to admit that he didn’t do much tackling. Lions defensive coordinator Gunther Cunningham seems to think that Eagles cornerback Nnamdi Asomugha doesn’t tackle, either. 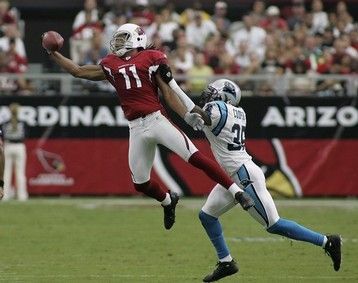 On Wednesday, Cunningham offered up this explanation regarding the perceived problem of small cornerbacks getting away with rough play on large receivers, like Lions receiver Calvin Johnson. Cunningham then tried to explain, apparently, that tall corners like Asomugha get in trouble for getting physical. Cunningham apparently isn’t saying that Asomugha won’t tackle, but that the rules (for whatever reason) prevent him from doing so. Regardless of whether Cunningham has a point, you’d think that he has learned not to talk about players under contract with other teams. Indeed, Cunningham’s comments about players he coached in Kansas City that ultimately got the Lions busted for tampering. Terrelle Pryor finally has an answer: He’s eligible for the NFL supplemental draft. And with Pryor’s eligibility finally determined, the NFL has now scheduled the supplemental draft for Monday. The NFL announced this morning that Pryor is eligible and set the date of the supplemental draft for Monday, August 22. The supplemental draft had previously been scheduled for Wednesday, but the NFL’s lengthy delay in determining whether Pryor would be eligible led to the whole thing being delayed, affecting not only Pryor but also the other players in this year’s supplemental draft: Western Carolina defensive back Torez Jones, Georgia running back Caleb King, Lindenwood defensive end Keenan Mace, North Carolina defensive end Mike McAdoo and Northern Illinois defensive back Tracy Wilson. Pryor, who had been the top high school player in the nation, was Ohio State’s quarterback for three years. Late last season the NCAA began investigating Pryor and other Ohio State players for taking improper benefits, and Ohio State said Pryor would be suspended for the first five games of the 2011 season. Ohio State later said Pryor wouldn’t have been allowed to play at all in the 2011 season, and Ohio State coach Jim Tressel lost his job in the investigation. In an odd twist on the NFL’s decision, Commissioner Roger Goodell determined that Pryor will be ineligible to practice or play in the first five weeks of the NFL regular season, although he will be allowed to play in what remains of the preseason. The NFL apparently wants Pryor to feel some pain for the problems he caused at Ohio State. But despite all that, Pryor will be eligible on Monday for any team that wants to spend a 2012 draft pick to acquire him. When the Panthers head to Miami on Friday, Cam Newton will be making his debut as a starter. More significant for the fans of the home team is that Reggie Bush will be making his debut with the Dolphins. Sparano also applauded Bush for putting in extra time as he prepares to get more touches than he received in New Orleans. Bush hopes to do more in Miami than he did in New Orleans, where he often served more as a decoy. The question is whether he’ll get be able to withstand the extra pounding that comes from extra touches. So much for the First Fan having a lot of faith in Jay Cutler. President Barack Obama, a self-proclaimed fan of Chicago sports teams (although he once failed to name a single player of the White Sox in a game broadcast), has piled on Cutler. The Green Bay Packers visited the White House this afternoon to celebrate their Super Bowl XLV championship. Naturally, the Packers gave him a little grief and you’ll recall there was some back-and-forth involving cornerback Charles Woodson last season. So, Woodson presented Obama with some stock certificate in the ballclub, making him one of the hundreds of thousands of shareholders. Then, the new part-owner of the club suggested a move he believes will help his team. 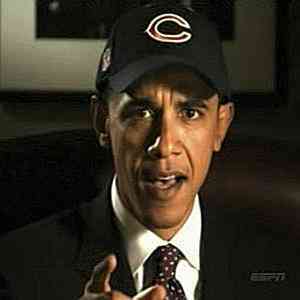 “If I’m a part owner, I think we should initiate a trade to send (Aaron) Rodgers down to the Bears,” Obama said. UPDATED: The White House since has worked to clarify the remarks, suggesting that Obama believes Rodgers would make a terrific backup to Cutler on the Bears. “The President understands the value of having a reliable backup quarterback – and (Rodgers as a No. 2 behind Cutler) would make it more likely that he could greet the Bears at a similar ceremony at the White House next year,” White House spokesman, Adam Abrams said. Now, it's time for the Packers fans to be upset we suppose. Tuesday came and went without Jeremy Maclin or the Eagles providing any more clarity on Maclin’s situation, despite a Monday promise from Maclin’s brother that an answer was coming. 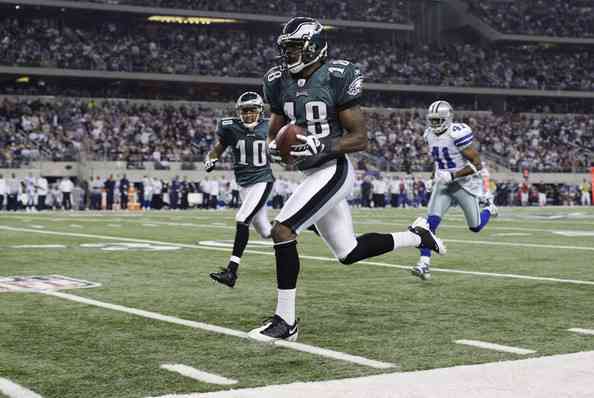 And that is serving only to cause more speculation regarding Maclin’s condition. Despite the rampant rumors, the word in the locker room is that Maclin suffers from mononucleosis and/or the lingering effects of it. Maclin disclosed in April that he lost 15 pounds in February with a “mono-like” illness. Washington Redskins quarterback John Beck will start Friday night's preseason game against the Indianapolis Colts, head coach Mike Shanahan said on Tuesday. With the Redskins expected to trade or release Donovan McNabb this offseason (McNabb was traded to the Minnesota Vikings), Beck operated this offseason and approached training camp as if he were the team's starting quarterback. Beck missed the preseason opener against the Pittsburgh Steelers with a groin injury. 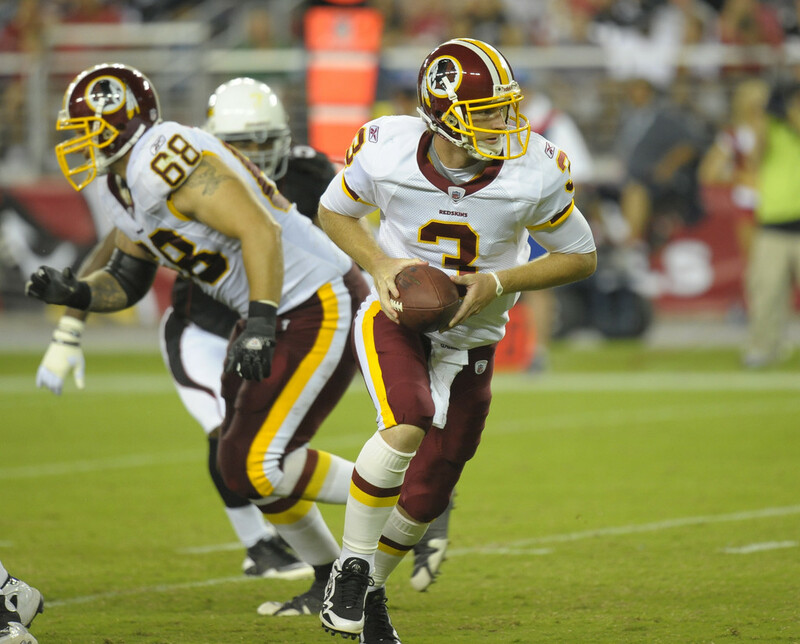 That game was started by the re-signed Rex Grossman, who completed 19-of-26 attempts for 207 yards and a touchdown before he was replaced by free agent Kellen Clemens in the second ahlf. Beck, who turns 30 this upcoming Sunday, has not started a regular season NFL game since 2007. 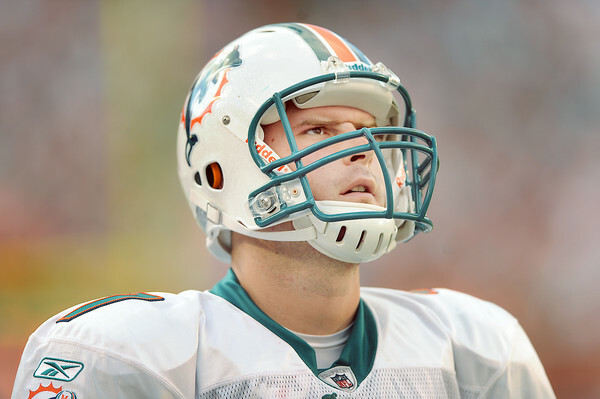 Beck started preseason games with the Dolphins in 2008 and Baltimore Ravens in 2009. Despite indications that the San Francisco 49ers are prepared to sign quarterback Daunte Culpepper to a one-year deal, a source with knowledge of the situation tells PFT that the move won’t be made immediately. Per the source, it could happen within the next week or so. Until then, Culpepper remains available. Looking at the depth charts in some NFL cities, it’s only a matter of time before his phone rings again. The Oakland Raiders have signed a pair of veteran safeties, adding Matt Giordano and Josh Bullocks to the roster on Monday, Steve Corkran of the Contra Costa Times reports. Both players are expected to be at today's practice, Corkran adds. Bullocks was a 2005 second-round pick out of Nebraska by the New Orleans Saints, and has totaled 290 tackles, one quarterback sack and six interceptions in 90 career games with the Saints (2005-08) and Chicago Bears, where he's spent the last two seasons. A fourth-round pick out of Cal by the Indianapolis Colts, Giordano has 85 tackles and three interceptions in 69 games. 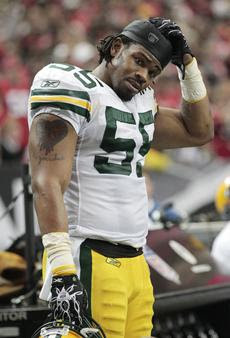 After four seasons in Indianapolis, Giordano spent 2009 with the Green Bay Packers and last season with the Saints. The Raiders likely lost veteran safety Hiram Eugene for the season to a dislocated hip. Cowboys coach Jason Garrett is telling his veteran players to treat rookies as equals. Garrett has joined Jaguars coach Jack Del Rio in banning rookie hazing from training camp. Last year, a controversy began in Dallas when rookie receiver Dez Bryant refused to carry the pads of veteran receiver Roy Williams. This year, Cowboys rookies aren’t carrying veterans’ pads at training camp. PFT reports that there definitely is a rumor on the NFL grapevine that something could be coming. 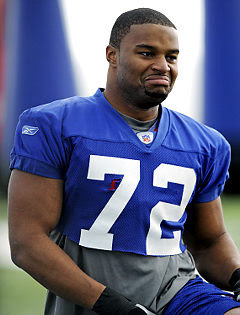 The Osi Umenyiora non-holdout holdout apparently has ended. Umenyiora, who reported a day late but who hasn’t practiced during training camp due to unhappiness with his contract or a knee injury or both, tells the Associated Press that he’ll return to practice on Monday. He said that he decided to return due to his feelings for his teammates, his coaches, and the fans. 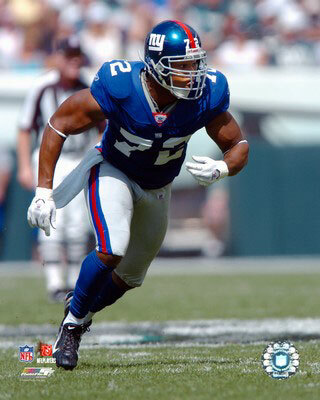 Umenyiora also said he’ll play under the current terms of the deal, and that he rejected an offer to sweeten the deal. That tells us this thing isn’t over. Why wouldn’t he take more money if he otherwise plans to cave? So while the Giants apparently have won this battle, Osi may have something else up his sleeve, especially since he’s now directly pandering to his teammates, the coaches, and particularly the fans. 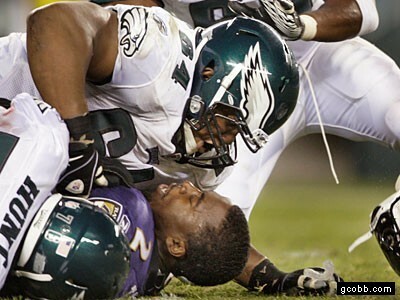 Then again, maybe Osi realizes that the possible emergence of Jason Pierre-Paul could render Umenyiora unnecessary. On Saturday, Sparano may have unintentionally, or otherwise, put his starting quarterback job in play. In those 36 plays on six drives, Moore completed 11 of 18 passes for 123 yards, two touchdowns, and an interception. Henne, taking 13 snaps on four drives, connected on four of eight for 77 yards, a touchdown and two picks. Of course, in the opinion of plenty of Dolphins fan the best thing Matt Moore has going for him is that he isn’t Chad Henne. Washington Redskins tight end Chris Cooley will miss a few weeks with a sore knee, head coach Mike Shanahan said on Friday night. "Keep our fingers crossed that he’ll be back. 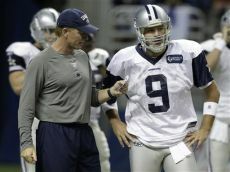 When it will be, I can’t tell you for sure," Shanahan said via Rick Maese of the Washington Post. Maese adds that the 29-year-old underwent arthroscopic surgery after last season, and has experienced irritation and swelling during training camp. An MRI did not reveal anything alarming, Shanahan said. The former third-round pick out of Utah State, Cooley has 420 receptions for 4,638 yards and 33 touchdowns over the last seven seasons. 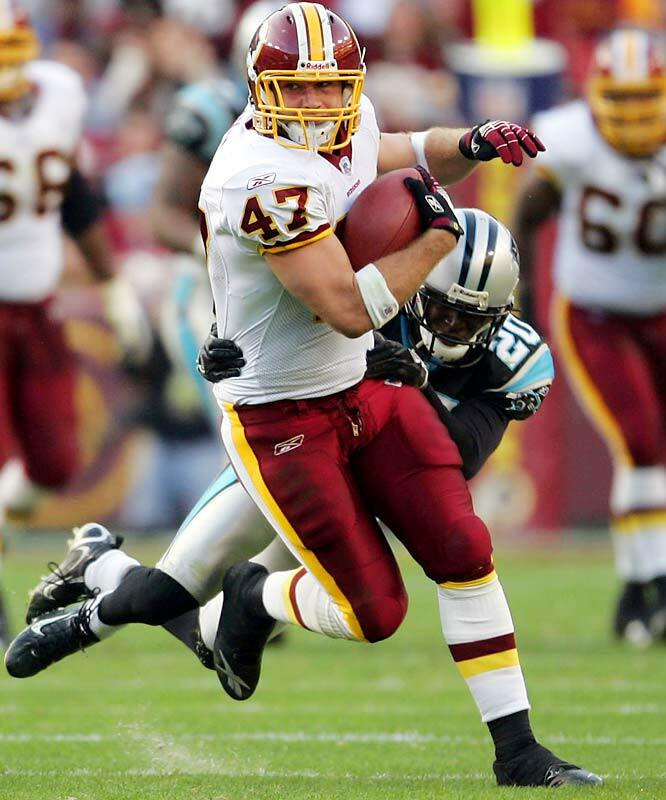 A two-time Pro Bowler, Cooley missed more than half of 2009 with an ankle injury, but rebounded to catch 77 passes for 849 yards and three touchdowns in 2010, his first season under Shanahan. The Green Bay Packers visited the White House Friday to be honored for winning the Super Bowl. But one player couldn’t get in. Packers linebacker Desmond Bishop didn’t have proper photo identification and couldn’t get through security to get to the meeting with President Obama. He wrote on Twitter that he had left his ID on the team plane. “I forgot my id on plane so won’t get access to see @barackobama,” Bishop wrote. Although Bishop surely could have had all his teammates vouch for him that he was in fact Desmond Bishop of the Green Bay Packers, that apparently wouldn’t be enough for the Secret Service. Bishop said that since he couldn’t get in to the White House he’d just return to the team plane and get some sleep. The Buffalo Bills have traded wide receiver Lee Evans to the Baltimore Ravens, ESPN's Adam Schefter reports. Buffalo will receive a fourth-round pick for Evans, Schefter adds. The 13th overall pick in the 2004 NFL Draft out of Wisconsin, Evans is a legitimate vertical threat, with his 377 receptions going for 5,934 yards, a 15.7-yard average. Only once during his seven-year career has Evans not averaged at least 15 yards per reception. Evans' ability to stretch the field should benefit starter Anquan Boldin, and take some pressure off of rookie wide receivers Torry Smith and Tandon Doss. The Ravens had previously explored signing former New York Jets wide receiver Jerricho Cotchery, who signed a one-year deal with the Pittsburgh Steelers on Thursday. Evans is signed through 2012 with base salaries of $3.275 million (2011) and $3.225 million (2012), with a $1 million roster bonus next season. Trading Evans to the Ravens means Stevie Johnson, who is entering the final year of his contract, becomes the No. 1 receiver in Buffalo, with the No. 2 job up for grabs between slot receiver Roscoe Parrish, former San Diego Chargers first-round pick Buster Davis, and second-year receivers David Nelson and Donald Jones. Although some (such as me) think that Brett Favre has a Roger Clemens-style half-season or two left in the tank, Favre said Thursday that he simply doesn’t have the motivation to play again. 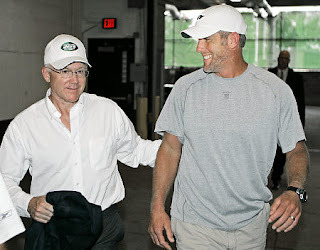 Appearing on WGR in Buffalo as part of the Hunter’s Hope Radiothon, Favre was asked by Joe Buscgalia if the future Hall of Famer has completely closed the door on a return in 2011. Favre initially said (jokingly) that he’d completely closed the door on a return in each of the past three years. But then, after acknowledging that he should have left the game following a “storybook” season in 2009 (but for the fact that the story ended without a Super Bowl appearance), Favre said he no longer has the motivation to play. “I could easily talk myself into that chip on my shoulder like, ‘Hey everybody hates you . 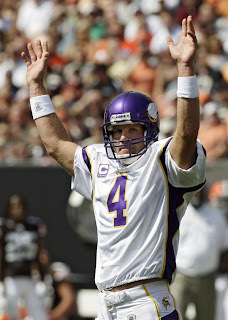 . . .’ and I could motivate myself,” Favre said. He then said that, now that he’s older, he simply doesn’t have the fire to do what needs to be done. “It’s that edge that makes the great players great,” Favre said. Favre said that his first season in Minnesota may have been his best year ever, and that it was fueled by a desire to quiet those who pointed to his performance down the stretch in 2008 as proof that the Packers were smart to get rid of him. So while he said he’ll miss it on Sundays, it sounds like he really is done this time. That said, given his recent history, I’m sticking with my position that Favre isn’t really retired until two seasons go by without Favre playing in at least one game. If a quarterback on a contending team pops an ACL after Halloween, Favre could be able to muster enough motivation for eight or nine games. 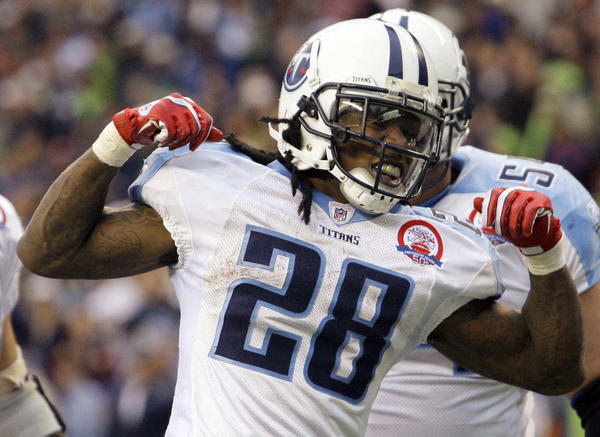 The Tennessee Titans say they are prepared to make Chris Johnson the highest-paid running back in the NFL. But they’re not going to do a deal with him until he reports to training camp. General manager Mike Reinfeldt told the Associated Press Johnson’s agent was the first person the club contacted when the lockout ended. The team re-did Johnson’s deal a year ago to get him more money and promised to re-visit the matter this year. Now, the running back is missing valuable time and the team is getting antsy. The three-time Pro Bowl performer has refused to report until he has a new deal and he’s said he would like a contract with $30 million guaranteed. Per the report, Reinfeldt said they have discussed the framework for a deal and the final details could be wrapped up in a matter of weeks. It’s been a touchy subject. Johnson’s agent Joel Segal hasn’t made any comments and the Titans have been mostly tight-lipped. "The reality is you hope those players are with you for 10 years and what you don't want to do is destroy a 10-year relationship over a two-week contract negotiation," Reinfeldt said. "People get upset at some point, we all come back, we're all family." Free agent wide receiver Jerricho Cotchery will not be signing with the Baltimore Ravens, Jamison Hensley of The Baltimore Sun reports. Cotchery, who was released last week by the New York Jets, visited the Ravens on Tuesday, but left without a contract. The Jets cited a failed physical in releasing Cotchery, who underwent back surgery in February, but Hensley reports there were no problems with his medical check by the Ravens. During his seven-year career with the Jets, the former North Carolina State standout caught 358 passes for 4,514 yards and 18 touchdowns. 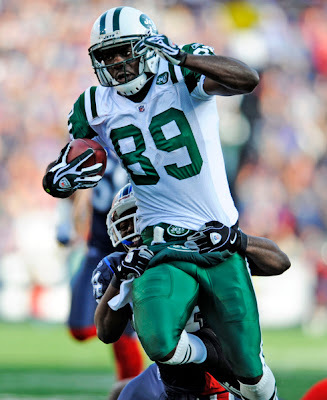 After the Jets signed Plaxico Burress, Cotchery and his $1.8 million base salary were released. The Jets used that roster spot to sign veteran wide receiver Derrick Mason, who spent the previous six seasons with the Ravens. With the departures of Mason, T.J. Houshmanzadeh and tight end Todd Heap, the Ravens do not have many experienced veterans to catch passes from Joe Flacco. 30-year-old Anquan Boldin is joined by 2011 second-round pick Torrey Smith atop the receivers depth chart, while 2010 draft choices Ed Dickson and Dennis Pitta are the top two tight ends on the roster.